Honestly, I’m not sure why they call it the Million Dollar Highway. Surely it can’t be the cost. I bet a million $$ would pay for less than a mile of this Colorado mountain road. Granted, they built it in the 1920s when a dollar went further, but this was obviously a difficult road to build. Perhaps it’s because of the million dollar views, that come at you one after another? Just as you round the corner from one glorious vista, another that tops it comes into view! Or perhaps it’s the cost of repairs for all those poor vehicles that couldn’t quite handle the lofty passes and steep grades on this winding route? This route is known as one of the most spectacular roads in the United States. It’s frequently included in lists of the top scenic drives, and it also makes lists of dangerous roads, too! 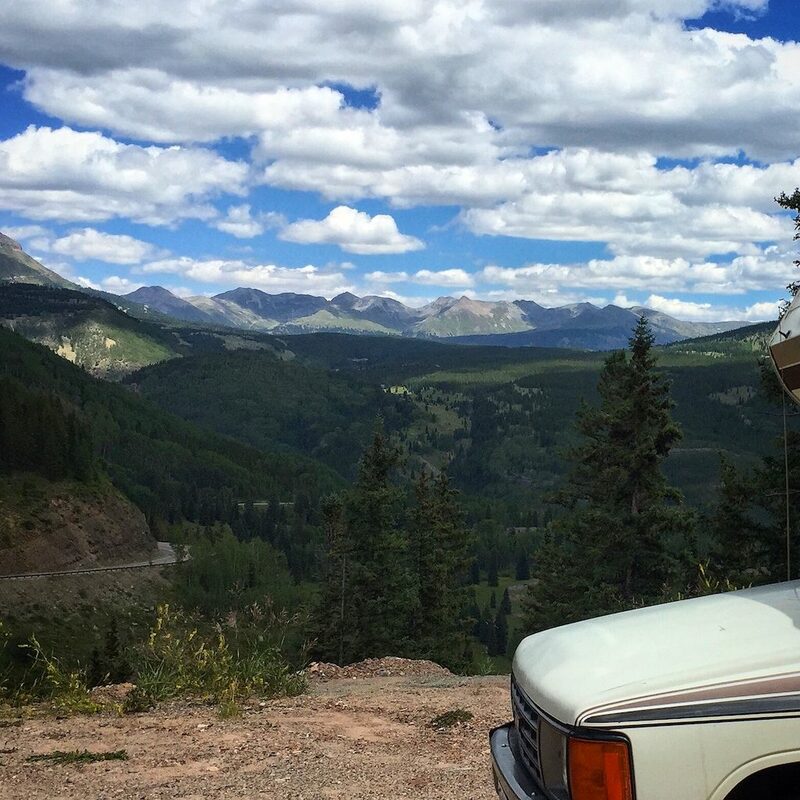 It’s a 2-lane road through the Rocky Mountains, with many twists and turns, steep drop-offs, and awe-inspiring views. Sadly, only the passenger can totally enjoy those vistas, since the driver needs to focus for this road! There are many hairpin turns, and often no guardrails between the narrow road and the depths below. The route follows Highway 550 heading north from Durango, which is also called the San Juan Skyway. 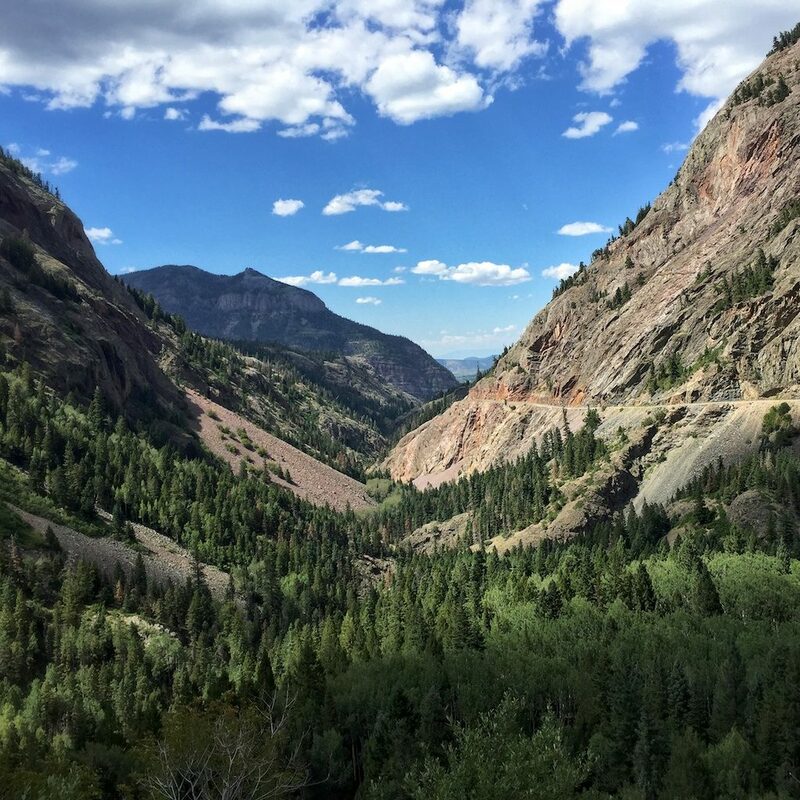 The “Million Dollar Highway” portion is about 25 miles long, and stretches from Silverton north to Ouray, Colorado. Should we drive this road? One thing you should know about Zennie is that she has a small, 4-cylinder engine. It’s been good enough to get us *almost* anywhere we’ve tried to go, but this is a big load for a small engine! I seriously considered alternate routes, knowing that these three high passes would be a challenge. I knew there would be some long climbs, but I hadn’t found any source that said what percent grade the roads were. The problem was that I was in Durango and was aiming for Wyoming, and this was the most direct route. I was in a hurry to make it to WY for the solar eclipse, and didn’t have a lot of extra time to take a long way around. So… I decided to go ahead and do the highly anticipated (yet also somewhat scary) Million Dollar Highway. If we made it, we’d get a spectacular drive, along with a sense of confidence for future mountain roads. If we didn’t make it, then at least I’d have some new knowledge about the limits of what we could(n’t) do. Can Zennie handle the Million Dollar Highway? The first big pass heading north from Durango is Coal Bank Pass. 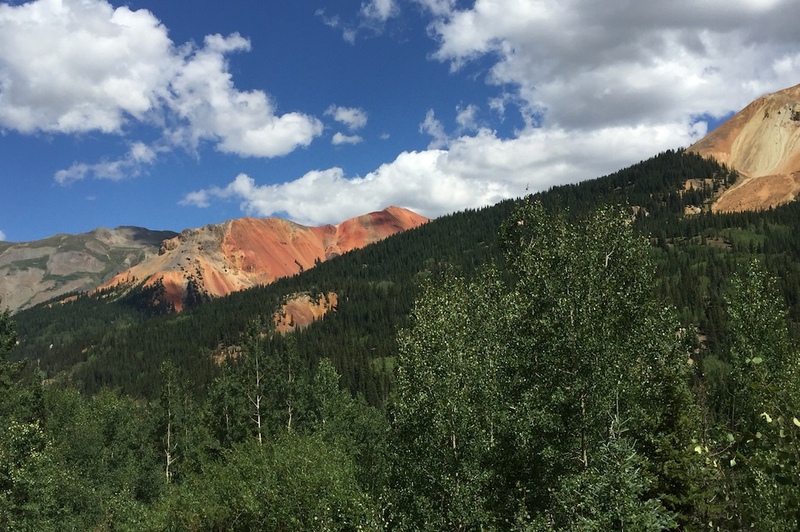 At 10,640 feet, the top of the pass is more than 4,000 ft higher than Durango. The grade varies, but it’s a long climb. We were in second gear for awhile, which is enough to handle moderate grades that other vehicles barely notice. Then we got to the steeper sections, and the only way to keep moving up the hill was first gear, going about 25 miles per hour. As the road went up and up (and up and up and up), I was watching the temperature gauge, and it was getting near the top of the white zone. I didn’t want to stop on a steep section, because it takes forever to get going again on an uphill, so I was hoping we could make it to the top. In the meantime, I turned the heater on full blast, which I’ve read can help by sucking heat out of your engine compartment. Uh oh… Stopped at the top of Coal Bank Pass. Argh!!! 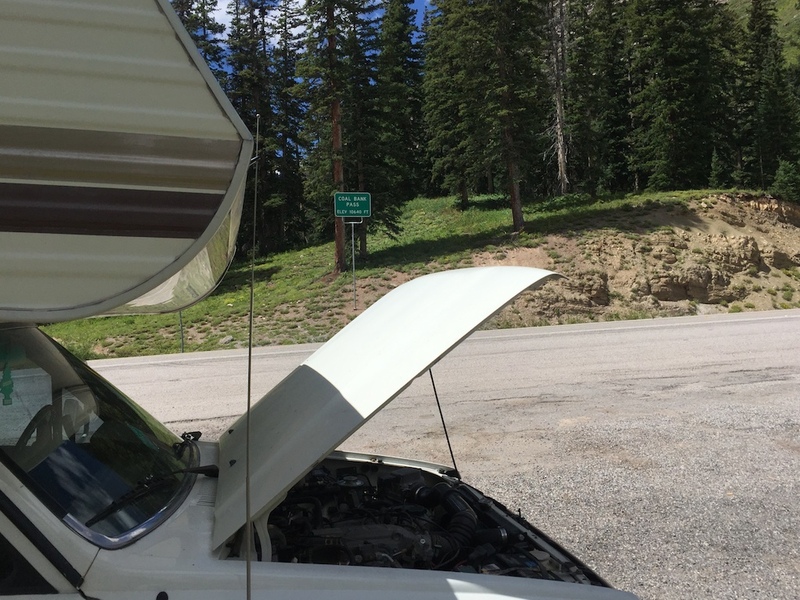 I went up front, and watched coolant pouring out of the front of my vehicle, as alarming noises continued coming from the engine compartment. I’d murdered Zennie, or at least done something seriously bad. I’d have to call a tow truck to get back to Durango. Just the towing bill would cost a small fortune! Then there’d be the mechanic bill, and surely the damage would cost a bundle to fix. Our traveling days would come to an end, either because Zennie was dead, or because I’d have to spend all my money to fix her. Fortunately, I have friends who know a lot more about motor vehicles than I do! And fortunately, there was a cell tower at the top of Coal Bank Pass! I texted some friends with questions about the situation. I also posted about it in a Facebook group for Toyota motorhomes, to get some feedback that way. It’s so good to have friends!! I got some texts and facebook replies within a little while. I also had a phone call with one friend back in Tucson, who helped me understand what was happening and what I should do. By this time, Zennie was all cooled down. As instructed, I refilled the coolant in the radiator and the reservoir, and we were good to go. Wow!! Once I got over the fear of killing my camper, the rest of this trip was awesome!! Yes, we went very slowly over the other two passes, but although they were higher elevation than Coal Bank Pass, they were also easier, since they started climbing from a higher point. There were at least a dozen places that I stopped to take photographs — places that made me want to say “Oh, oh, look at that!” So I could pull over to take pictures, while Zennie could chill for a bit, then we’d get back on the road to the next amazing photo stop. And after the last pass, it’s all downhill from there! Don’t stop the engine right away. Turning off while it’s hot = boiling the coolant away! I’d been watching the temperature gauge, and knew it was running hot but not in the red zone. I was right to want to cool it down, but my mistake was turning the engine off when I stopped. Instead, keep it running until it gets back to a moderate temperature. Have some car-knowledgeable friends. I hate to brag, but I have wonderful friends! 🙂 I’ve never been a car person myself, but I have friends who know a lot, and who’ve been willing to help me out when I have a problem. If it wasn’t for friends, I would have been facing a tow truck back to Durango, and an unnecessary mechanic bill. Carry extra coolant. This came in handy! After losing my brakes at the top of Lizard Head Pass the year before (another story!) I also now carry extra brake fluid, transmission fluid, power steering fluid, and engine oil. It can be such a simple fix if you have the right stuff with you, and such a big problem if you don’t! Do it! Driving the Million Dollar Highway, that is. If you’ve got the chance, go for it! This is an amazing drive, just outstanding! A picture is better than any thousand words I could write!